A mudslide has caused serious panic in the state of California in America as it destroys homes killing many people. No less than 13 people have been killed as homes were torn from their foundations in flash flooding in southern California. According to Metro UK, the heavy downpours sent mud and boulders roaring down hills stripped of vegetation by a gigantic wildfire that raged in the state in December. 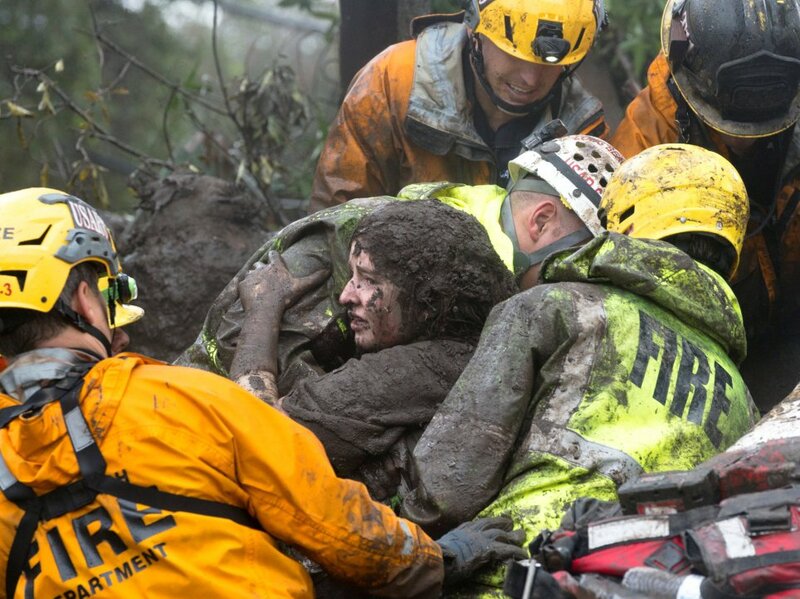 Rescue crews used helicopters to pluck more than 50 people from rooftops because trees and power lines blocked roads, dozens more were rescued on the ground and firefighters pulled a mud-caked 14-year-old girl from a collapsed Montecito home where she had been trapped for hours. It’s believed that most deaths occurred in Montecito, a wealthy enclave of about 9,000 people northwest of Los Angeles that is home to such celebrities as Oprah Winfrey, Rob Lowe and Ellen DeGeneres, said Santa Barbara County spokesman David Villalobos. At least 25 people were injured and others remain unaccounted for. The mud was unleashed in the dead of night by flash flooding in the steep, fire-scarred Santa Ynez Mountains. Burned-over zones are especially susceptible to destructive mudslides because scorched earth does not absorb water well and the land is easily eroded when there are no shrubs. The torrent of mud early on Tuesday swept away cars and destroyed several homes, reducing them to piles of lumber. In daylight, Mr Tighe was shocked to see a body pinned by muck against his neighbour’s home. Photos posted on social media showed waist-deep mud in living rooms. Evacuations were ordered beneath recently burned areas of Santa Barbara, Ventura and Los Angeles counties. But only an estimated 10 to 15% of people in a mandatory evacuation area of Santa Barbara County heeded the warning, authorities said. The worst of the rainfall occurred in a 15-minute span starting at 3:30am on Tuesday. Montecito got more than a half-inch in five minutes, while Carpinteria received nearly an inch in 15 minutes. Montecito is beneath the scar left by a wildfire that erupted Dec£ember 4 and became the largest ever recorded in California. It spread over more than 440 square miles and destroyed 1,063 homes and other structures. It continues to smoulder deep in the wilderness. The storm battered much of the state with damaging winds and thunderstorms.